For a special 102 Not Out promotional video show the fab duo and stars of the film, Amitabh Bachchan and Rishi Kapoor, doing their own version of the infamous selfie pout. However, they encounter a few problems along the way! It is so dang cute and hilarious we had to share it! Plus we have a bonus! 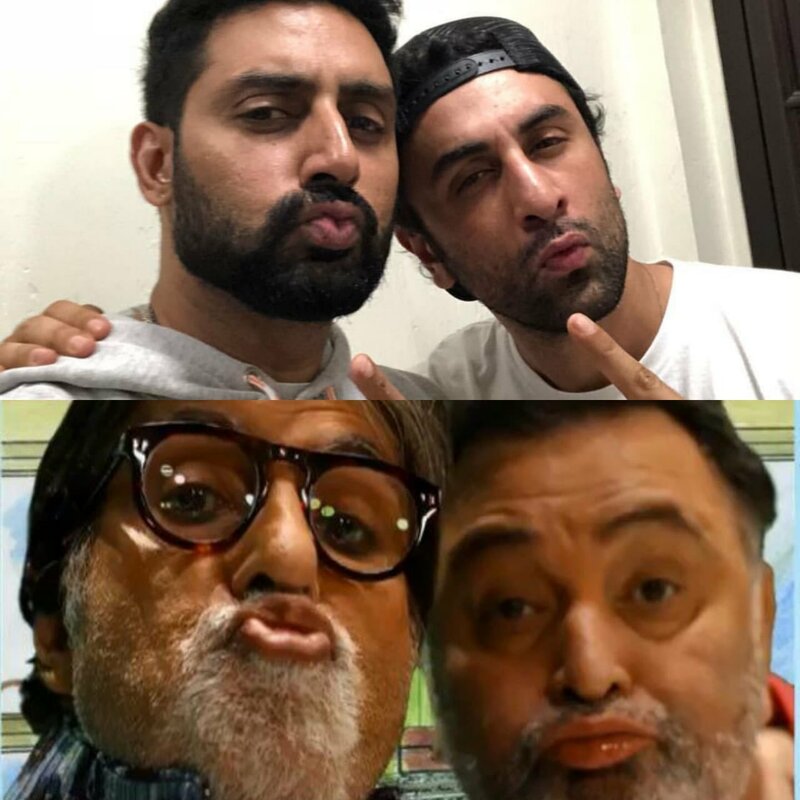 A picture of Amitabh and Abhishek plus Rishi and Ranbir giving us their best selfie pout! Check out the pouting club! Directed by Umesh Shukla, 102 Not Out, which is in theaters now, is an ageless comedy that brings together Indian Cinema’s two biggest stalwarts – Amitabh Bachchan and Rishi Kapoor after 27 years. The two legends are playing a father-son duo in this brilliant film. 102 years young, Dattatraya Vakharia (Bachchan) lives life to the fullest and wants to break the record of oldest living man – that’s held by a 118 years old Chinese. Dattatraya wants to live a stress free life in order to become the oldest living man. However, there is only one hindrance – his 75 year old son Babulal (Kapoor) who has resigned himself to a life of old age stuck in drudgery. Dattatraya now must find means and ways to change Babulal’s sad and grumpy demeanor so that he doesn’t become a deterrent in breaking the record. Little do they realize that this roller coaster ride filled with comedy, emotion and commotion, will change them and their relationship forever. 15 queries in 0.320 seconds.